The Coffs Harbour Hino location before construction completed. 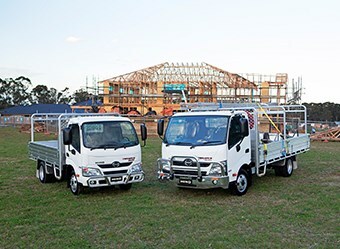 Hino Australia has a new Coffs Harbour dealership after Newcastle Commercial Vehicles opened a new outlet on the mid-north coast of New South Wales. Situated 350km from Newcastle Commercial Vehicle’s original site in Beresfield, the new outlet is anticipating strong sales in an area scheduled for a population and housing boom according to AHG Newcastle Group general manager Paul Tomlin. "Coffs Harbour is a key location and an area of impressive growth, with the local population forecast to increase almost 30 per cent over the next 15 years," Tomlin says. "We're delighted to have been appointed to represent Hino in the Coffs Harbour region, and we look forward to raising the profile and market penetration of Hino trucks in this important location." While the new site will stock a range of Hino models and will shortly offer demonstrator test drive models, the dealership is expecting the focus to be on Hino Built to Go Trade Ace, Steel Ace and Tipper truck and body combinations as the number of tradespeople grows. The new Coffs Harbour Hino is open weekdays (8am – 5pm) and Saturdays (8am – 12pm), and the parts and services department is open on weekdays till 11pm.